Here begins the story of Philip as told outside the New Testament canon. The Apostle Philip the Evangelist became the first bishop or leader of the Nazarene Ecclesia in Caesarea, the port city of Herod the Great. Along the docks of this thriving Mediterranean port city, Philip had set up residence with his four daughters recognized as prophetesses in a town that was more liberal, cosmopolitan and free. This city became the gateway of the Nazarenes to the rest of the Roman world. Along the landing slips were ships docked from every port of the Mediterranean. Around the coast of Spain up the Atlantic Ocean to the western isles of Britannia, the Jewish Nazarenes and soon to be gentile Christians would freely travel around the Roman Empire. As we shall see in Part Six, “The Final Exile of Joseph of Arimathea from Israel to the Isle of Avalon”, there is historical evidence that Joseph of Arimathea did return to the British Isles. Upon his arrival now as an emissary of the Nazarenes, the first international message of the death and resurrection of Jesus reached the Arch Druids of Britain and the Royal Silurian family of Wales. The accounts are sketchy, but it appears that the evening of the trial and death of Yahshua when the elder of the Sanhedrin, Joseph of Arimathea, ‘boldly’ claimed the body of Jesus, within hours, the Temple guards took him into custody and put him into chains. There with the seal of Caiaphas, he was imprisoned. Even though Joseph of Arimathea was protected under Roman law as a Roman Decurio, for he was an officer in the Roman army, he could not escape the fury of Caiaphas and Annas for what he had done for Jesus. He had denied them the opportunity to forever dispose of the body of Jesus. Instead he sealed Jesus in a tomb like the royal prince of David which He truly was. His position as one of the “elders” in the Jewish Sanhedrin was stripped, yet his friendship with the Roman Procurator Pontius Pilate protected him. Of all the members of the friends and disciples of Yahshua, Joseph retained the power and authority of the Roman government and his vast estates in Jerusalem and Ramallah north of Jerusalem provided a safe haven for the members of the early Nazarene Ecclesia in its days of infancy. Did Joseph of Arimathea immediately leave the city and return to Britain? The historical evidence in sketchy at best. Records do indicate that the extensive properties of Joseph of Arimathea and the Bethany family’s hereditary properties of their Syrian governor were eventually liquidated except for the Bethany home which remained in the possession of the Jewish Nazarene Ecclesia as a house of Prayer. (Maurus, Rabanus, Archbishop of Mayence (AD 776-856 CE), copy of the Life Of St. Mary Magdalene, chapter , quoted in Taylor, The Coming of the Saints, Artisan Sales, POB 1529, Muskogee, OK 74402. 1985, pg. 87-8) As the Nazarene Party grew larger and the members of the Ecclesia grew bolder, the anger and wrath of the Sanhedrin now coming under the complete control of the House of Annas who sent Jesus to be crucified and hang on the tree and now sought to destroy Joseph of Arimathea. He would now be a hunted man, an outcast of the Sanhedrin, now seen as an enemy of the temple Sadducee authorities. Somewhere in this time frame after 30 CE when Yahshua died on a tree, was entombed in a royal tomb and was resurrected in exact fulfillment of the typology set forth by the Pesach (Passover) Lamb, we find Joseph of Arimathea and a large group of immediate friends and family of Jesus moving to the city of Caesarea. The power of Pontus Pilate was weakening and the coordinated efforts of Pilate and Caiaphas were becoming more tenser as the two rivals to the polity of power, greed and control of Judea. This power struggle would eventually break, one or both of them would eventually go down. Time was getting short. Yet along comes another friend. 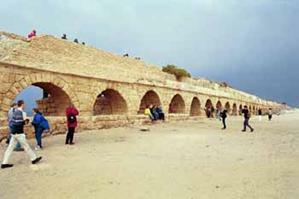 According to the early traditions, the Roman centurion in Antioch which Jesus had healed his servant appeared to have been transferred to Caesarea. When he was transferred is open to question. It was the Jewish historian Hugh Schonfield, who believed that Cornelius was transferred during the change of Roman rulers when Herod Antipas was deposed in 39 CE. With the power of authority in Galilee reverting back to total Roman hands, there was a massive change in all the Roman administrative offices. Yet this late date is not in harmony with the growing evidence of history of Joseph of Arimathea leaving the area of Judea for the rest of his life. Acts 10:1 - "At Caesarea there was a man named Cornelius, a centurion in what was known as the Italian Regiment. He and all his family were devout and God-fearing; he gave generously to those in need and prayed to God regularly." Simon Peter said of Cornelius. "I truly understand that God shows no partiality, but in every nation anyone who fears Him and does what is right is acceptable to him." Yet the case could be made that by the year 35 and 36 CE, the stability of the Roman sovereign power and rule over Judea was in question. They were being challenged by the manipulations of the House of Annas with Caiaphas, the son-in-law as the official high priest. For sixteen years, ten of which were under the control of the Roman Procurator Pontus Pilate, the land of Judea had a local administrator or governor living in the land. Pilate’s main residence was in Herod’s palace in Caesarea where the Roman soldiers in Judea were housed in the praetorian. Vitellius, the newly arriving legate for Rome in Antioch made a calculated and astute move and carefully set the stage to completely change the political and religion power structure in Jerusalem. As we have seen, he was making preparation to oust both Pontius Pilate as Procurator and Caiaphas as High Priest as their political power together was becoming too cozy and Tiberius Caesar was becoming more aware that this geo-political pair was unhealthy to the interests of Rome. But why? Pontius Pilate in the eyes of Rome had made some calculated but not fatal mistakes. Early in his career he had tried to install some images of the Emperor in Rome on ensigns throughout the city which almost left thousands of Jews dead. This was not in the best interest of Rome. It was the policy of Rome to allow cultures more ancient than theirs to have a degree of independence and autonomy in the hope of keeping those cultures stable and productive. Even in those days, Judea was the breadbasket of Rome. This event caused significant turmoil in the land of Judea but it remained internal and the rise of the Nazarene Party appeared to stabilize the country and keep it productive, so no external action on the part of Tiberius Caesar was done. Yet over the years, the dissent and rash acts of the Jews against the Jews began to escalate. Pilate did not seem to have any control. Everything in the land of Judea had the marking of one man, the maturing and more powerful Ananus. A man of extreme talent and lust for power, the internal politics of Judea had remained under his grip for twenty eight of the thirty years since he first became high priest. 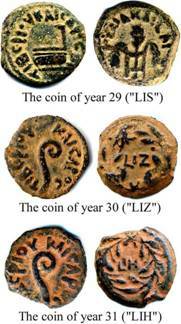 It was 6 CE and the year of the first Roman taxation in the land of Judea. A revolt was sweeping throughout all the land first with Judas. The land had been under the control of the son of Herod the Great. Born in 23 BCE, Archelaus, became the son of Herod and Malthace. Archelaus became the tetrarch of Judea when his father, Herod the Great a ruler known as a tyrant died early in 4 BCE. The people in the land rejoiced and the citizens of Judea were disposed to accept Archelaus when in his first public assembly he promised to regard the best wishes of his countrymen. The accession of King Archelaus was met quickly with resistance and the golden Roman eagles over the entrance to the Temple was pulled down by two popular Jewish teachers, Judas and Matthias. On March 13, 4 BCE, Judas and Matthias plus their students were burned alive in Jerusalem with massive throngs of angry Jews. Most of the people of Judea, hundreds of thousands were in Jerusalem for the spring Passover of 3 BCE, which was a Sabbatical Passover, and Jews from all over the world in the Diaspora were returning to the land of Judea. The pulse of the strident demands of the Judeans was so great that Archelaus sent a Roman detachment of soldiers to Jerusalem to quell the progressively agitating throngs, yet the Romans were not able to subdue the population. So Archelaus sent the whole garrison of Roman soldiers and in the onslaught, three thousands Jews were massacred on the pavements of the Temple. 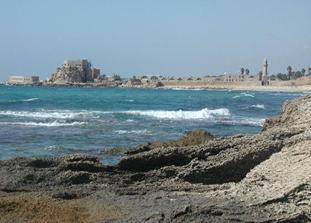 Archelaus quickly left Caesarea by ship and headed to Rome. When he arrived, awaiting his honors to be as the newly crowned king of Judea, he found that his brother, Antipas, with a large Herodian support living in the city of Rome had already claimed that the second will of Herod had actually nominated he, Antipas, as king. Then there came a deputation of fifty influential Jews with the support of about 8,000 Jerusalem residents, who came with a petition the Emperor, which was supported by many of the Herodian family, asking Rome to annex Judea as a province of Rome rather than have another king from the House of Herod. Augustus Caesar chose otherwise. Judea would not be a Roman province, but was divided even more into weaker kinglets, who would pay allegiance and tribute to Rome. So the extensive kingdom of Herod the Great was divided into three smaller kingdoms. Archelaus was appointed at the Ethnarch (“national leader”) of Judea, Samaria and Idumea. They would no longer have a king. Gaza, Gadara and Hippus were to be under the control of the Syrian province. Herod Antipas, the full brother of Archelaus, was made tetrarch of Galilee and Philip, the half brother to Archelaus was made tetrarch of Perea and the lands east of the Jordan. To understand the life of Jesus as a child, youth and as a young rabbi in the land of Judea, it is critical that the historian and any reader of Christian literature must have a fundamental awareness in the geo-politics of Judea and their relationship to their overlords, the Romans. The life of Jesus began in the days of Herod the Great. Since Herod died in 4 BCE, a date well documented in history, then the story of Jesus must begin prior to this date. Here we introduce the First Birth ceremony of Yahshua as a neonate. Though, there is no secular historical documentation of a massacre of Jewish babies in the village of Bethlehem, the cruelty of Herod as a ruler to his family, his friends and the population of Judea at large is well documented. That Herod killed all the children two and under suggests that Yahshua could have been as old as a two-year old child. Toward the end of Herod’s life, his paranoia of loosing the kingship of Judea to any rival aspirant to the throne of the Maccabeans or the throne of David did lead Herod to murder of his favorite wife, Mariamme, and his son by her, an heir also of the Maccabean family royal dynasty. Yes, the schizophrenic mindset of Herod as he listened to the three Magi of the eastern Parthian kingdoms could easily have set off a murderous rampage through the village of Bethlehem. Yet, in an act of Providence, the Christ child was safely on his way to Egypt. Allowing another year from the Bethlehem massacre to the final agonizing death of Herod, the birth of Yahshua would be closer to the fall of 7 BCE. Archelaus was in Rome while the settlement for who would be the successor of Herod the Great was in progress. Augustus sent over a Roman procurator, Sabinus, who was ruthless and merciless to the Jewish people. Then more trouble in Judea occurred. The mental state of the kingdom was one of frenzy. The people were rioting across the land while the spring festivals of the Lord were approaching. During the festival of Pentecost, the city of Jerusalem was ripe with political-religious agitation and generalized commotion. Sabinus, the Roman procurator, sent over Roman troops to suppress the unrest in the precincts of the Temple. While initially successful, he gained access to the inner treasury of the Temple and robbed the Treasury of the Temple. When the Jews heard of the desecration of the Temple Treasury, riots arose all over the province and soon the Roman troops were spread too thin. The ruthless competence of Herod the Great could only be matched by the utter incompetence of his son Archelaus. While the forces of Archelaus were desperately trying to subdue the Jewish uprising, new rebel leaders kept arising. First there was Judas the son of Hezekiah of whom Josephus wrote about. Then we have record of a second revolutionary leader in Galilee, a rebel called, Simon of Perea, who rose with a band of zealots east of Galilee. Flavius Josephus – “There was also Simon, who had been a slave of king Herod, but in other respects a comely person, of a tall and robust body; he was one that was much superior to others of his order, and had had great things committed to his care. This man was elevated at the disorderly state of things, and was so bold as to put a diadem on his head, while a certain number of the people stood by him, and by them he was declared to be a king, and he thought himself more worthy of that dignity than any one else. The last of the major revolutionaries was Athronges and his four brothers began a series of revolts over a decade. Here we have three revolutionary forces running guerrilla warfare against the larger and more disciplined forces of Archelaus and eventually Roman forces themselves. For almost ten years, these zealots harassed their oppressors, but the final battles centered around the exile of the ruler they loathed and suddenly having even less freedom than before, they suddenly found themselves under direct taxation by the Roman government. The forces of Archelaus were being cut down and his kingdom was in jeopardy. Publius Quirinius Varus, the Roman legate in Damascus, was then forced to bring into Judea several legions of soldiers, with the military assistance of Arêtes, the king of the Arabs in Nabathea, the land of Petra. Prior to that, the people did not pay taxes directly to Rome, but paid their taxes to Herod. Now, every fourteen years, they had to face an onslaught of Roman tax collectors. With the loss of their own native rulers, the Roman government officials with all their methodical and serious governmental arrived into all major homes across Judea, Samaria, Galilee and any other Jewish provinces. There they assessed the population, the industrial assets, the agricultural assets and set up a taxation schedule for all the Jews to pay. Into this political unrest, we can now open the Book of the Apostle Matthew and begin to understand the dilemma of Joseph and Mary as they are instructed that it is time for them to return to the land of Judea. Here they were as a family with the babe, Yahshua, and afraid to return to the land ruled by the Herod Archelaus (Matthew 2:22). Mary and Joseph finally decided to settle in the province of Galilee, which was under the rulership of Herod Antipas. The rulership of Archelaus was so inept that both the Jews and the Samaritans appealed to Caesar. It finally took another bloody revolt this time by Judas the Galilean over the Roman taxation. This is the political fervor behind the story of the Second Birth ceremony of Jesus in 6 CE when He was twelve years old or at His Bar Mitzvoth. Archelaus was finally deposed in 6 CE. 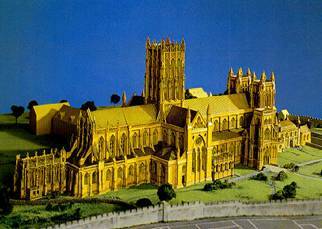 He was exiled to Vienne in Gaul, the retirement center of exiled Roman authorities located in central France. There he died twelve years later about 18 CE. The Imperial legate to Syria made a complete overhaul of the governance in the land of Judea. Coponius, a cavalry officer under the Syrian Legate Quirinius, became the first official Roman military governor in Judea & Samaria. The lands and estates of Herod were confiscated and the wealth of the new province of Judea had to be determined. Coponius first task was to conduct a census in both Samaria and Judea to establish a tax base for Rome. Immediately there arose a tax-revolt by the radical Pharisees (Judah of Gamala & Zaddok). According to Josephus this revolt became the root of a Jewish independence party, the Zealots that were prime movers in the open revolt and war with Rome 60 years later. In the book of Luke, he claims that Judah of Gamala "perished and all who followed him were scattered" (Acts 5:37). In the first part of the rule of Archelaus we find the return of Joseph and Mary to the land of Galilee with Jesus, probably sometime between 3 to 2 BCE. Eight or nine years later after the exile of Archelaus in 6 CE and the initiation of Roman rule by Publius Quinctilius Varus, we find Joseph, Mary and Jesus arriving in Jerusalem and Bethlehem for the Passover in 6 CE. Here is the political framework for the beginning of the curse of a Roman census and their first official Roman taxation. Yahshua at this time (6 CE) was at the age of twelve years or the year of His Bar Mitzvoth. During this festival of Pesach, Yahshua was found in the Temple dialoging the chief priests and elders (Sanhedrin). Here they wondered in awe at the beauty and clarity of the Mosaic laws as He explained them in His childlike simplicity. So in 6 CE, we have the imposition of Roman rule for the first time. The rule of Herod the Great and his son Archelaus was over. A new imperial legate to Syria, Quirinius, had been appointed and the first Procurator or Roman military governor, Coponius, was nominated. Under all this change, we find the appointment of a new High Priest in Jerusalem, Ananus the son of Seth. (Josephus, Antiquities, VIII, ii, 2) One other little known fact, Matthias ben Joseph, a Hasmonean descendant of the Maccabean kings and priests and the father of Flavius Josephus was born. Ananus (Annas) true Jewish name was Hanan, the younger. As the sixty-fourth High Priest since Aaron the High Priest, Ananus became the chief priest in charge of the services of the temple and minister of public worship. It was his duty to preside over the services of Yom Kippur, the Day of Atonement and usually presided over the services of Pesach, or the Feast of Passover. As civil servant, he automatically became the head of the Jewish Sanhedrin. That Ananus was deposed in 15 CE by Valorius Gratus when he became Roman legate in Syria was only a blip in the road to the power and authority by Ananus. Ismael, son of Phabi (Josephus, Antiquities XVIII, ii, 2) was installed as the high priest, but that lasted only one year, when Eleazar, son of Ananus (Josephus, Antiquities XVIII, ii, 2) was installed. Only one other year, when Simon, son of Camithus (Josephus, Antiquities XVIII, ii, 2) was installed as high priest did the office of the High Priest pass outside the hands of the House of Ananus between 6 CE to 41 CE when Herod Agrippa I came to rule over Judea. For thirty three out of thirty five years, Ananus, the patron and father of the dynasty of the House of Ananus was the most powerful controlling force in the political, social and religious governance in the land of Judea. The throne behind the power of the high priest was Ananus. It was this family that was called ‘The Jews’. During the years of the ministry of Jesus in Galilee, Caiaphas was the legal high priest in Jerusalem. The party of the Sadducees was called in those days the ‘orthodox’ Jews or those obeying the legal laws of Moses, but blending them with the legal laws of Rome. To the Sadducees, Ananus was the real high priest and recognized by them as God’s high priest. To say that Ananus, the high priest was the most powerful and the most wealthy Jewish man in Judea is an understatement. It was Ananus who received all the revenue of the temple of Herod. It was Ananus who controlled the ‘money changers’ who used switch and bait tactics in the animals used in the services of the Temple. To also say that Joseph of Arimathea, the Jewish Roman decurio, an officer in the Roman army and minister of the tin and lead mines of Britain is also an understatement. Joseph of Arimathea with his vast estates in Jerusalem and Ramallah was not a competitor but a threat to the power and authority of Ananus with Caiaphas, his son-in-law. Into this power arena we now set the life of Jesus, the Jewish Rabbi called Yahshua ben Joseph ben Heli, who was the great nephew of Joseph of Arimathea. Yes, Joseph of Arimathea was the younger brother of Heli, the father of Mary. The Drama of the life, ministry, trial by the Sanhedrin, His death and resurrection and the final realization by Jesus’ followers that He truly was the Son of God incarnated into human flesh become the political and religious trappings around the life of Jesus. It is this great Drama that the playwrights and movie producers have tried to portray in part that has been created and recreated over two thousand years. From the demise of the House of Herod to the fall of Jerusalem, Ananus controlled the office of the high priest more than any other political family in Judea. He had the satisfaction of putting manipulating three Roman Legates to Syria, Quirinius (6-12 CE), Calpurnius Piso (16-20 CE), and Lucius Vitellius (36-39 CE). He and his sons, son-in-law and grandsons also controlled the office of the Roman procurators, Coponius (6-9), M. Ambivius (9-12), Annius Rufus (12-15), Valerius Gratus (15-26), Pontius Pilate (26-36), and Marcellus (37-41). Through he and five sons, Eleazar, Jonathan, Theophilus, Mattathias, Ananus, one son-in-law, Joseph Caiaphas, and one grandson, Mattathias son of Theophilus, the power of Ananus and the House of Ananus extended clear to 66 CE and the start of the revolt with Rome. It was this family, the House of Ananus that; put Peter and John in prison, captured Peter and many apostles, imprisoned and flogged them, put Stephen the deacon to death by stoning, incited King Agrippa I to behead James the brother of John, and captured to kill the Apostle Peter and then stoned, beat and killed James the Just, the brother of Jesus and the leader over the Hebrew Nazarene Ecclesia in Jerusalem for thirty two years. Before Pontius Pilate could be deposed and a new procurator appointed, the Roman Legate, Vitellius, has to rearrange his entire staff under the command of a centurion that he could place his trust. The critical power base and central command center of Rome was at the former palace of Herod in Caesarea. This is where the procurator lived and the Roman military Praetorian where the Roman troops were housed. For the time period between 36 and 37 CE, Vitellius took over the helm of politics in the Roman province of Galilee under the rulership of Herod Antipas while he was preparing to mount a Roman counter-attack against the Nabathean ruler in Petra, the Arab Arêtes, who had earlier routed the forces of Herod Antipas in 35 CE. This invasion was not to commence until 36 CE and the surrounding provinces had to be first secured. When that occurred, Pontius Pilate was deposed as he was in the spring of 36 CE and sent back to the Isle of Capri to testify before Tiberius Caesar who lived in seclusion on the island away from Rome. Only then could Vitellius depose Caiaphas the High Priest and risk an uprising of the Jews induced by the House of Annas when their political money laundering enterprises in the Temple of Herod was threatened to be disrupted. At the same time, he was gathering together the proper forces of Roman legions to mount an invasion into the heart of the Nabatheans, the impenetrable region of Petra. How fortunate this would be for the Nazarene apostles in protective custody in Caesarea. Under his Roman guardianship, Cornelius the centurion could now protect the Apostle Philip and his family, the Bethany family, Mary Magdalene, Martha of Bethany, and Lazarus, and the family of Jesus, including Mary, the mother of Christ, Cleopas and her sister, Mary Salome. It was also near this time that Zaccheus was appointed bishop of Caesarea by Peter. Moving the Centurion Cornelius and his family was truly a stroke of providence as the Lord of hosts was setting up a Roman shield of protection for the mother of Jesus, Mary, the Bethany family, Joseph of Arimathea, Cleopas and many others who moved to the cosmopolitan city of Caesarea. They were now outside the power base of the Sadducees in Jerusalem. Under the protection of Cornelius, this apostolic group of friends and disciples of Yahshua, living in the residence of Philip, were cared, shielded and protected from the growing wrath of the Ananus’ controlled Jewish Sanhedrin. Yet on the other hand, the textual evidence suggests that the religio-political forces against the Nazarenes did not occur until after the stoning of Stephen. It appears that probably at the same time the debate over the temple and the sacrificial system between James the Just and Gamaliel, sometime about 36 CE. In fact the whole conflict in the Hebrew Ecclesia in Jerusalem that led to the ordination of the deacons in the first place was over the displeasure that greater provisions and supplies were given to the Hebrew women then the gentile female converts to the Nazarene party. The women in the Hellenistic sector of the Nazarene community were jealous of the deference given to Mary, the mother of Jesus, to Mary Magdalene, Martha, Mary Salome and others that had supported the ministry of Yahshua from their estates and inherited wealth for years. Envy and jealousy do so much to disrupt the work of the Lord and it was these two seeds of discontent that brought harmony in the early Nazarene Ecclesia to a standstill. The entire economy of the early Ecclesia was equalitarian and communistic. Every member gave all their assets to the Ecclesia and these assets were to be shared equally with all. The story of Ananias and Sapphira who deceptively kept part of their liquid assets after their property sold. They lost their lives because of their deception is only a mini-drama of this unique experiment in utopian social reform. It was this utopian society that was trying to transform the Jewish Essene social culture to a larger multi-cultural society. There was no evidence that there was any migration of the apostles to any region outside of Jerusalem until the debate between James the Just and Gamaliel in the temple and the trial and stoning of Stephen. The Reign of Tiberius Caesar. When we search the life of that “rich man” in Jerusalem, Joseph of Arimathea, the Roman Decurio what we have learned is that he did live in Britain and Celtic Wales while conducting his business affairs with the Caesar of Rome. As a Decurion over the Jewish tin miners on the Cornwall peninsula, we also fail to find any evidence that he quit his business affairs with the Roman government. Somewhere between 34 and March, 37 CE, ‘in the last year of Tiberius Caesar’ according to Gildas, the message of the risen Christ did go to Britain. The translation of this text as recorded by John Taylor in The Coming of the Saints is different and the dating is a little broader. Gildas the Wise – “These islands received the beams of light – that is, the holy precepts of Christ – the true Sun, as we know, at the latter part of the reign of Tiberius Caesar, in whose time this religion was propagated without impediment, and death threatened to those who interfered with its professors. Though the text does not specifically state that the ‘beams of light’ were taken by Joseph of Arimathea, there is a certainty that he was the prime candidate in his future mission as the “Apostle to the British.” Did Joseph of Arimathea go back to the British Isles after the Passover death of Jesus in 30 CE, only to return back to Judea a few years later? That is a possibility. It appears that the authors of the early histories were looking for a national revival to the cause of Jesus in the isles of Britain. This national revival would not come until another century. The seeds were planted and the roots that did take place would be so potent that it would change the Christian Church forever. Scholars are divided over the interpretation of Gildas statement as to whether the “Rays of Light” went to the British Isles in the ‘latter part of the reign of Tiberius’ or in the ‘last year of the reign of Tiberius’. As we shall soon see, both of these statements may be right as Joseph probably had two missions to Britain; one trip that was personal, business and intentional and the second that was non-intentional and with the company of twelve other disciples. Tiberius Claudius Caesar Augustus Germanicus was born on November 16, 42 BCE and died in 37 CE at the age of 80. He was emperor of Rome for twenty-three years between 14-37 CE. As the heir to the Principate of Rome upon the death of Augustus Caesar, he was a sharp contrast to the open, tactful and very approachable predecessor. Historians talk about Tiberius Caesar as an enigmatic figure who was darkly complex, intelligent, cunning, and able administrator but given to fits of depression and dark moods. Today we would say that he had Bi-polar Disease. De Imperatoribus Romanis - “Although he was not a tyrant himself, Tiberius's reign sporadically descended into tyranny of the worst sort. In the right climate of paranoia and suspicion, widespread denunciation led to the deaths of dozens of Senators and equestrians, as well as numerous members of the imperial house. In this sense, the reign of Tiberius decisively ended the Augustan illusion of "the Republic Restored" and shone some light into the future of the Principate, revealing that which was both promising and terrifying. Born to the houses of the Old Republicans of Rome, he was the son of Ti. Claudius Nero and Livia Drusilla. When his mother divorced his father and married C. Octavius, Tiberius’ life forever changed. The reason, C. Octavius (Octavian) would soon to be known as the future Augustus Caesar and Tiberius would be his step-son. His mother and step-father, Augustus, lived a life of mutual respect and loyalty to each other despite the fact that she could not father him any children. Livia was truly the first lady of the Empire. It was her family, her wealth, and her confident and powerful personality and through her family all the Julio-Claudian emperors would descend. 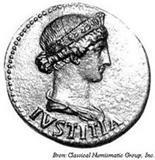 Tiberius was her son; Gaius (Caligula), was her great-grandson; Claudius, her grandson; Nero, her great-great-grandson. During his lifetime, Tiberias saw the mighty civil war between Mark Antony and Octavian that ended in the epic battle of Actium in 31 BCE. Octavian Augustus Caesar was now secure as the head of state. During the parade in Rome, it was Tiberius who was privileged to sit to the left of his step-father in the triumphal chariot. Born into a privileged family, his early years saw Tiberius rapidly ascend in Roman politics: assumed the toga virilis or the gown of manhood in 27 BCE and was led into the forum. Three years later he became a quaestor and was given a consulship five years in advance of Roman law. He later appeared in court as an advocate and was then sent to the east in his proudest moments to recover the golden eagles of the legions that were lost to the Parthians in the failed eastern campaigns of M. Crassus (53 B.C. ), Decidius Saxa (40 B.C. ), and Mark Antony (36 B.C.). In 13 BC he entered the praetorian ranks and became a consul. Later he entered into active service with his half-brother, Drusus Claudius Nero fighting the Alpine tribes in Gaul. Earlier he became governor of Gallia Comata in 19 BCE. When it came time to chose his own successor, he stayed true to Augustus's plans for the succession and clearly favored his adopted son Germanicus over his natural son, Drusus. It was Sejanus, his trusted advisor in whom Tiberius bestowed the keys of the kingdom. 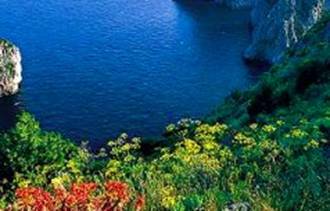 Then he withdrew to the Isle of Capri and never again did he return to Rome. As Tiberius was caught in a maze of political intrigue before he was crowned the emperor of Rome, when he became emperor, Tiberius was also caught in the bureaucratic nightmare of Roman politics. Most of this was around Augustus’ passion on having a proper number of successors to the emperor of Rome. During this time, Tiberius the one blessed moment of his life was the happiness he received in the marriage to Vipsania Agrippina, the daughter of Caesar Augustus's friend and confidant, M. Vipsanius Agrippa. Married probably around 20 or 19 B.C., Vipsania gave birth for Tiberius a son that they called Drusus. Augustus Caesar, was very meticulous in making arrangements for the imperial succession. It was his instinct to favor a Republican and as such favored his immediate family, especially the Julian family. First, Augustus’ nephew Marcellus was favored, but Marcellus died a premature death in 23 B.C. Augustus then used his daughter Julia to tie his friend M. Vipsanius Agrippa into his family by marriage. The marital union in 21 B.C. was a fertile one. Out of it were produced two sons within four years, both of whom Augustus adopted in a single ceremony in 17 B.C. These labyrinthine arrangements seeking a dynastic successor have been the fodder for Roman scholarship for centuries. Understanding Augustus’ passion for the Julian lineage for the heirs of the future Roman Caesars, it is more understandable that there was no place in his succession for his step-sons: the stepson Tiberius or step-grandson Drusus. Agrippa was evidently favored as the heir-apparent, and the boys, Gaius and Lucius Caesar, would to follow in the next or the third generation. If Tiberius did have ambitions or his mother Livia for him, these were completely subordinated to Augustus's wish and passion that a Julian would sit at the helm of the Principate. Yet as history does, fate was on Tiberius's side. In 12 BCE, Agrippa died and Tiberius was now in line to be Augustus's successor. Tiberius, feeling the pressure of his step-father, was compelled to divorce Vipsania and marry the widow of Agrippa, Julia. Though this marriage could bring heirs to the Tiberius’ household that were of the part of the Roman elite, the Julian family, there was unhappiness and no children. Tiberius as stated was happily married to Vipsania and in a politically embarrassing moment when they were found together in public, Augustus forbad Tiberius to see his ex-wife. Suddenly in 6 B.C. Tiberius announced his retirement from public life. Though the visible heir to Augustus Caesars’ throne, he chose personal exile and went to live in Rhodes with a few friends and an astrologer called Thrasyllus. Why he did so is still the intense speculation of ancient and modern scholars. For whatever reason, the motive was more than snubbing his father-in law, Augustus. Augustus' was upset and as such, he refused for years to allow Tiberius to return to Rome, when Tiberius began to recognize the delicate social relations he allowed himself to get into. Even the influence and persuasion of Livia, his mother was of no avail. Then the artful cascade of imperial succession began to crumble. It was in 2 CE, the grandson Lucius Caesar died in Massilia of an illness. Even so Augustus Caesar would not be persuaded to allow Tiberius to return until the dual pressure of both Livia and Gaius Caesar, the emperor finally relented. 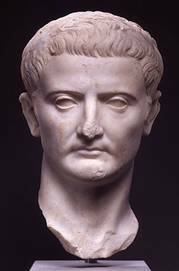 Tiberius did return to Rome but as stated he lived in a “political wilderness.” And then the unexpected occurred, the next grandson, Gaius Caesar was killed of a battle wound while fighting in a siege in Armenia. Augustus now in a crisis. Turning once again to Tiberius, the outcast prince was recalled from his private life and this time he was adopted as Augustus's son. Also adopted by Augustus was another step-son, Agrippa Postumus, who was the third son of Julia and Agrippa. Augustus then forced his will again in the life of Tiberius his step-son. In spite of having a natural son, Drusus, Tiberius was compelled to adopt his nephew, Germanicus, the son of his half-brother Drusus Claudius Nero who was married to Mark Antony's daughter, Antonia. 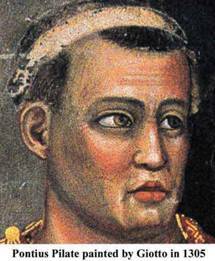 Once again it was Augustus who was trying to bring the Julian family back into favored family blood line for the Roman royal purple. This route lay only through Germanicus for his children did have Augustus's blood in their veins. When Caesar Augustus died, the legions in the regions of Pannonia and in Germany began to voice dissent and soon the most powerful concentration of troops in the empire began a mutiny over their pay and the conditions of their lives. Immediately, Tiberius’ sons, Germanicus and Drusus were sent to quell the mutiny. The wars were bloody especially in Germany where Germanicus was sent and total chaos broke out. In spite of the able service of his son, Drusus, Tiberius recalled Germanicus from Germany and according to the wishes of Augustus, Germanicus was celebrated in a triumphal return to the city of Rome in 17 CE while the service of Drusus was ignored. Germanicus was granted imperium maius over the East. After he was assigned as consul with Tiberius in 18 CE, he was sent to the Eastern realms of the empire like his adopted father, Tiberius. The road to the imperial succession again came to an abrupt end when one year later, Germanicus died only after accusing the Syrian governor, Cn. Calpurnius Piso of plotting his murder. Yet the stain of the murder though never substantiated resting at the door of Tiberius’ parlor. Tiberius was now the sole ruler of the Roman Empire. All the primed successors of Augustus Caesar were now gone. With the death of Germanicus, Tiberius began to groom his own son, Drusus, to replace him as the emperor of Rome. With the strain between him and the family of Germanicus, his royal advisor, Praetorian Prefect L. Aelius Sejanus took over more and more of the administrative functions of the empire. This trust in his advisor was almost a fatal decision on the part of Tiberius. Slowly the nine different cohorts of the Praetorian Guards that were carefully and discretely placed in separate small towns around Rome by Augustus were brought within the city in one camp and under one administrative central control. With the military under his control, Sejanus began to enhance his public profile by erecting statutes to himself in public arenas. Praised by Tiberius as “the partner of my labors,” Sejanus appeared to be establishing his own path of authority. It was the chronicles of the Roman historian Tacitus that gave the account of the subversive acts of the trusted advisor of Tiberius, Sejanus. Livilla, the daughter-in-law of Tiberius, married to his son Drusus was soon caught up into a romantic relationship by the seductive powers of Sejanus. Drusus on the other hand was highly suspicious of his father’s advisor. Trouble was fermenting in the imperial household. The Prefect with the aid of Drusus wife, Livilla, poisoned Drusus in 23 CE. The friends and family of Tiberius’ wife, Vipsania Agrippina soon found themselves under suspicion with the charges of treason. This was only a guise, according to Tacitus, by Sejanus to move the accusing finger away from himself. Two years later in 25 CE, Sejanus asked Tiberius for imperial permission to marry Livilla, the widow of Drusus but Tiberius refused. 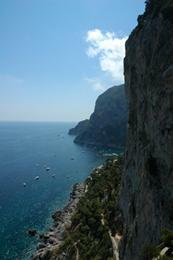 And then suddenly, Tiberius retired to the Isle of Capri. There he isolated himself and sunk into bouts of depression and the plague of imperial rulers; paranoia. Never again would he set foot again into Rome. With no opponents, Sejanus now had complete control of the administrative power in the city of Rome. While the imperial court of Rome was enmeshed in political intrigue and every political authority’s life was at risk, in the province of Judea the voice of the “Baptist” began to proclaim in the wilderness, “Prepare ye the way of the Lord.” Here we begin to the finger of the Almighty One of Israel embroiling the city of Rome in her own deceit and intrigue. Unbeknown to them, the young Rabbi Yahshua was quietly beginning his public ministry in Galilee, teaching the peasant population what the life in the “kingdom of God” was like. He healed the sick. He soothed the wounded emotions, gave them a concrete path of righteousness for them to tread. For the mentally deranged, he cast the demons out and freed them from the powers of the satanic forces. With Tiberius isolated on the Isle of Capri and Sejanus in his greed to obtain final control of the Roman Empire, the ministry of God’s Son spread like wildfire throughout Galilee and into the province of Judea. Unnoticed or suspected by the Roman authorities, the ministry of the Son of God was received as with the joy of the “early rain in the fall” throughout the provinces that were under the Herodian family or the governorship of the Pontius Pilate. During this time also message of the “kingdom of God” reached into the highest echelons of the Jewish and Roman society. The secret followers of Yahshua included; members of the Herodian family, elders of the Great Sanhedrin in Jerusalem and possibly even the wife of the Governor Pilate. As Yahshua was hanging on the tree outside the gates of Jerusalem in 30 CE, the fury of the power hungry Sejanus was in the final stages of usurping complete control of Roman politics. Tiberius’ wife, Agrippina, her eldest son, Nero Caesar and later her youngest son Drusus Caesar were arrested and imprisoned. At the pinnacle of power and control, the defacto emperor of Rome was now Sejanus. While the Senators of Rome were lining up to pay respects to the power center of Roman polity, the God of Israel was accomplishing His great Act of redemption for all mankind. The year of Yahshua’s death and resurrection, Tiberius changed his mind and permitted Sejanus to marry the daughter of Livilla, the granddaughter of Tiberius. Betrothed in 30 CE, Sejanus was now destined to become a member of the imperial family. 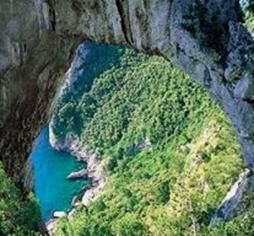 He was now the chief and only path to the aging emperor in Capri. In 31 CE, Sejanus became the Consul with the emperor, an honor reserved only for heirs to the throne. When this consulship was surrendered soon afterwards, he was given a share in the emperor’s proconsular power. On October 18, 31 CE, Sejanus was summoned to a meeting in the Senate with the expectations that he would be given a share of the tribunician power and become Tiberius’s Agrippa. The letter that was written by Tiberius in Capri to the Senate started out in praise for Sejanus’ service, yet quickly changed with charges that Sejanus was a traitor and with demands for his arrest. Unknown also to Sejanus, the Praetorian Guard that was under the control of Sejanus had been secretly transferred by imperial order to the command of Q. Sutorius Macro. The Senate was in confusion and those Senators that were in closest alliance with Sejanus were quickly exiting in fear for their safety from the Senate building. The city of Rome was in total chaos. Sejanus was arrested by the Praetorian Guard, imprisoned and soon executed. The order went out to arrest the family of Sejanus, his accomplice Livilla, Tiberius’ daughter in law plus the friends and followers of this power hungry proconsul. For the next two years the full arm of the political massacre continued to play out in the capital of the Roman Empire. While the political foundations of the empire was crumbling in Rome, the organizational foundation of the Hebrew Nazarene Ecclesia was formed. It was modeled between the Grand Sanhedrin of the Jews in Jerusalem and the Essenic social economic structure. James the Just, a respected Tzaddik (righteous one) in Judea was nominated as its leader. The fact that he also was Yahshua’s (Jesus’) brother also suggested that the Nazarenes held the same respect for family dynasties as the Jews did in the high priestly family of Aaron and Zadok in the temple of the Lord that was later usurped by a new family dynasty of high priests, the Sadducean Family of Ananus. The threat to the power and political control by the Family of Ananus of the Family of Joseph the father of Jesus (Yahshua) was played out also on the Roman political platform between the House of Tiberius and the family of the House of Sejanus. Both were embroiling the politics and religious hierarchy of both Rome and Jerusalem between the years of 30 – 33 CE. While the city of Rome was engulfed in a general massacre of threatened rivals of powers by the family of Sejanus, the city of Jerusalem was soon to be engulfed in a pogrom against the Nazarenes led by the Family of Joseph whose adopted son was now a recognized Jewish anointed one and messiah and his real son was the leader of the fastest growing Jewish sect in the province of Judea. The wife of Tiberius, Vipsania Agrippina remained under house arrest, while Drusus her son was imprisoned in the basement of the Palatine. By 33 CE, both would die violent deaths. . The fragile mental state of Tiberius sunk him into great despair and depression. His closest friend and confidant had turned traitor to him. His wife and family were dead. His plans for imperial succession were destroyed. He withdrew himself even more from any public life, running the affairs of the empire by letters while the political machine of Augustus the Great continued the imperial administrative functions in smooth succession. The full realization that the death of his son Druses was instigated by the hands of his “friend” Sejanus soon became full reality in his mind. The wrath and paranoia of this Roman emperor knew no bounds. It was on March 16, 37 CE, Tiberius Caesar died quietly by some accounts and “smothered by a pillow” by others at his villa at Misenum at the age of 78. Though an able administrator, Tiberius when he died was so unpopular that the Senate of Rome refused to vote upon him the honors of “divinity.” As the news of his death spread throughout Rome, the mobs flooded the streets of that royal city with chants, “To the Tiber with Tiberius!” His succession would soon favor his depraved nephew, Gaius Caesar Augustus Germanicus (b. 12 CE, d. 41 CE and emperor 37-41 CE) called “Caligula” rather than his grandson, Tiberius Gemellus. The implications of the reign of Tiberius on the life and time of Jesus are profound. While all prior emperors were outward expanding in the early years (Julius Caesar and Octavian Augustus Caesar) and those afterwards were demented (Gaius Caligula and Nero), except in the reign of Augustus Caesar when “Pax Romanus” reigned throughout the empire, the reign of Tiberius was spent in self absorbed narcissism. The strangest working of the Divine was seen as the geo- political Greco-Roman world would become so self-possessed with their own drama of power, greed and control that the God of Israel could send His Son to fulfill the Plan of Salvation enacted from the creation of this planet earth. Today we can see the finger of the Almighty One of Israel weaving through the nations surrounding Judea while the Nazarene Ecclesia could mature enough to spread the “Good News” of the risen Savior to the rest of the then known world. Up until the date of the crucifixion of Yahshua, the care of Mary the mother of Jesus had been under the custody of Joseph of Arimathea, the younger brother of Heli. As we have seen in the study on the House of Joachim and Hanna, the Parents of Mary, we came to the conclusion that Heli, the father of Joseph in the account by the physician Luke, was actually the father of Mary. Further on in the study, Joachim in the Christian traditions who was the father of Mary was the same person as Heli in the gospel of Luke. What we do know in the history of the Judah was that good King Josiah had two sons, Jehoahaz, who was deposed by the pharaoh of Egypt (2 Chronicles 36:3) and in his place he appointed his brother, Eliakim to be king over Judah and Jerusalem and Jehoahaz was taken prisoner to Egypt. 2 Chronicles 36:4 – Then the king of Egypt made Jehoahaz's brother Eliakim king over Judah and Jerusalem, and changed his name to Jehoiakim. So looking outside the canon to historical Jewish/Christian texts give us historical pearls that amplify the sacred texts of the Bible. Together, many times Jewish and Christian traditions do merge with canon and provide a clearer picture of the social, political and historical surroundings of a Biblical event. Mary truly was the daughter of Heli and born into the house of Judah of the lineage of David, king of Israel according to the Lucian genealogies. That the early church fathers attest to the validity of the apocryphal book, the Protoevangelium of James is well known. Even today, the Eastern Catholic Church, now the Eastern Orthodox Church accepted it as canonical even though it has been rejected by the Western Roman Catholic Church who still use it for historical reasons as stated and the Protestant Churches who ignore it outright. In this official capacity, Joseph was called the ‘Paranymphos’ or the custodian of Mary. With the death of Joseph, who by tradition was much older than Mary, by Jewish Law, the nearest unmarried brother of kin to the dead brother either could marry his brother’s wife or would be responsible as the custodian or ‘paranymphos’ of his brother’s wife. The evidence that Mary and Jesus had possibly already traveled to Britain in the custodial care of Joseph of Arimathea is attested in the ancient authors as discussed in Jesus in Glastonbury. As the political events on the week of the Passion came to their climax, Yahshua, now hanging on the tree, knew that the cascading events would be changing quickly. He was no doubt aware that Joseph of Arimathea, his uncle, was in town. Up to this time, His uncle Joseph was a ‘secret disciple’. At the illegal trial of Yahshua, Joseph became “revealed” in his open defense of his nephew Yahshua by the Sanhedrin during the hours of the night. After this moment, Joseph of Arimathea was a marked man by the House of Annas. A full scale war would soon erupt by the family of Ananus and Caiaphas the high priest against Joseph of Arimathea. Throughout the day of trial, Yahshua was shunted back and forth across Jerusalem. Everyone wanted to grandstand and look official and important, but no one was willing to be counted and say the obvious; Jesus was innocent and should be found ‘not guilty’. First to the home of Annas/ Caiaphas, then to Pilate’s Praetorium, then on to Herod’s Palace, back to Pilate’s Praetorium and finally to the temple before he was led out the Eastern Gate and across the causeway to the Mount of Olives to the site of His hanging and crucifixion. Every party involved lacked the integrity and honor to say that Yahshua was innocent except the Roman governor, Pilate, who then capitulated to the manipulation of the high priest emeritus, Ananus. There on the side of the Mount of Olives as the participants in the crucifixion drama looked down upon the beautiful temple of Herod, Jesus gave the custodial care of Mary to John, his cousin, the son of Zebedee. Was this an on the spot decision of Jesus as he spoke to his mother and John while He hung on the crucifixion tree on the Mount of Olives? Was this pre-arranged with his uncle Joseph of Arimathea? We know that Yahshua knew of his impending capture, trial and death. He had forewarned his disciples to this fact, but in their denial they remained clue-less all through the events of the Passion week as though they were walking through a fog. In their despair, they all fled, including Simon Peter, that brave bodyguard at Gethsemane, except for one, the Apostle John. Only John stood unscathed in the courtyard of Annas and Caiaphas. Only John stood with the mother of Jesus, Mary, along with Mary Magdalene and Mary Salome. The custody of Mary was now safely in the hands of her nephew, the Beloved Disciple John, though temporary, to take her away and spare the gruesome finally of Jesus’ final moments of life. It would also be critical at the moment of death that no family members would be present. This was important for Joseph of Arimathea, the great uncle of Jesus could ‘boldly’ come forth to claim the body of his nephew. With the hour being late, the sun was beginning to set. The High Shabbat (Sabbath) of the most holy day of Passover was near. Joseph could rightfully proclaim with urgency that he was the legal guardian and had been for years and the rightful custodian for the body of Yahshua. After the death of Jesus and the blatant burial of Jesus in the family rock hewn tomb near the Mount of Olives, Caiaphas, the high priest and his father, Anna were furious. It was their intention that Jesus’ body would be quickly dumped into an unknown grave and Jesus’ life and legacy they felt would quickly be snuffed out. Yet here now was the body of Rabbi Yahshua entombed in a stone hewn mausoleum befitting a king where all the peasants and zealots in the land could pay homage to Him. Besides there was also the prophecy, that in three days he would be raised up. Quickly the temple guards were posted around the tomb for security and protection. The story of the mysterious resurrection of Yahshua is told in the article, Dissent in the Early Christian Church. During this time according to tradition, Joseph of Arimathea himself was cast into prison. Upon release he disappears from Jerusalem and who or what happened to the benefactor who gave his family tomb was never revealed in the Brit Hadassah (ReNewed Testament). Sometime between 32 and 35 CE, we find Joseph of Arimathea back living in Judea, but not in the vicinity of Jerusalem but in the home of Philip the Evangelist with the Bethany Family in the city of Caesarea. Here in the city of Caesarea, the Nazarene Ecclesia would quickly find that the Lord of hosts was opening the next door to the expansion of the Nazarene faith. It was an exit door from Judea to the world beyond. From all accounts we find, Philip the Apostle and the Evangelist was living in Caesarea with his four daughters who were recognized as prophetess. It was at the home of Philip that we begin to see his influence as the official travel coordinator for Hebrew Nazarenes under the coordination of the Apostle Peter as they were exiting and arriving in the land of Israel. Here the disciples of Jesus would find a home that became the Hebrew Nazarene’s home away from city of Jerusalem. 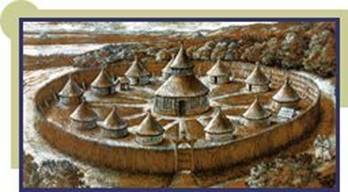 Again they were using the model of the Essenes of having a home which all lived with possessions held in common. This utopian model of social living would be valuable in that the disciples of Yahshua would be traveling around the world. With homes around the world, they could travel and lodge with the minimal of expense. Wherever the apostles and disciples traveled, a home place would be strategically placed whose doors of fellowship, safety and comfort would be present. Only sixty-five miles northwest of Jerusalem, a good two to three days journey, we find the second ecclesia built around the home base of the Apostle Philip. In this cosmopolitan city where Romans and Greek of the west mixed with Jews and Syrians of the east as they blended in the politics of international commerce, Herod built what was to be the capital of the Roman province of Judea. It soon became one of the great cities of the ancient Mediterranean world. 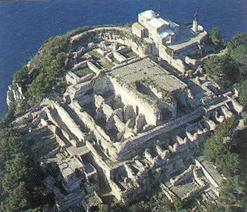 Between 25 to 13 BCE, on land given to him by Augustus Caesar, Herod the Great would make his mark in city building. In this city, next to the Palace of Herod where the Procurators of Judea lived and the home base for the Roman legions that were housed in the Roman Praetorium, the Nazarenes could find protection under Roman law and justice. Here was an artificial port and harbor that was built along the dangerous passageway between Rome, Athens, Syria and Alexandria. 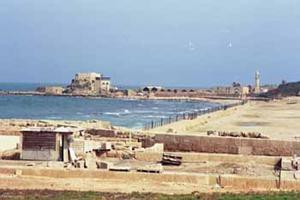 The city of Caesarea boasted of a port whose harbor was larger than the famed harbor of Athens, called the Piraeus. 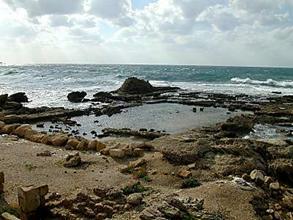 From Caesarea, the apostles could now travel to Rome in only ten days by ship. An animated description can be see on how this port was constructed at Virtual Caesarea Maritima. It was on a prominence of the new city that a temple gleaming in polished stone could be seen from the shore and beside it a ‘colossal statue’ dedicated to Caesar Augustus as Jupiter Olympus. This statue was visible for miles out at sea as well as a second statue of Rome representing the deity Juno. Nearby was an open-air theatre that was built on the slopes of the hills some miles north of the city, as well as an amphitheatre capable of containing 38,000 spectators. Along the coastline were seen great houses or palaces built of white stone and marble, several public building including the Praetorium where the Pilate’s and Agrippa’s council room was build, areas for residential buildings and a complete underground sewage system. Public fresh water was transported by aqueduct from Mount Carmel seven miles to the north and a second aqueduct ran three miles north to the River Zerka. to the people of Caesarea a temple in honor of Tiberius." 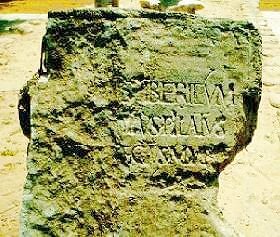 To date this is the only archeological evidence that Pontius Pilate ever did exist and resided in Caesarea and was the governor of Judea in the days of Tiberius Caesar. Into this picture we enter the testimony of Clementus Romanus. This historical event was recorded in the book, the Recognitions of Clements. The Apostle Barnabus apparently very early after the death of Jesus went to the city of Rome and preached the message of the risen Christ. It was there that Barnabus met Clements Romanus, of British descent, who was a convert to the Nazarenes by Joseph of Arimathea. Clements Romanus became one of Barnabus’ most prominent disciples. Our next historical event is that Barnabus and Clements are traveling to Jerusalem to meet with the apostles and disciples of Jesus. It is the thesis of the BibleSearcher that the Sabbatical Passovers that occurred every seven years were major events in the life of the Hebrew Ecclesia of Israel in Jerusalem. As every religious institution has a supreme council of church leaders, so also the Jewish had the Sanhedrin and the Nazarenes also recreated a Sanhedrin within their sect or party. Yet it was imperative that all the apostles and disciples get together to share in the mission of the Nazarenes and to develop strategies on the future mission of the Nazarene faith. It is true that they were all Jewish orthodox believers and as such participated fully in all the festivals of the Lord in Jerusalem. Yet every seven years, for hundreds of years, pilgrims from all across the diaspora would return to Jerusalem during the festivals. The city and the surrounding countryside would be packed with thousands, yea hundreds of thousands of pilgrims flocking to that sacred site in the temple of Herod. So also the Nazarenes returned back to Jerusalem to meet in a Supreme Council with all the apostles and disciples. The seven year Sabbatical Year after the crucifixion of Jesus on 30 CE was three and one-half years after His death and resurrection. Using the model that Jesus did die in the midst of the literal week of the Passover week during the Passover Passion Week of 30 CE, He also died in the midst of the Sabbatical Week of Years between 26-27 CE and 33-34 CE Sabbatical Years. It is possible the Jesus also died in the midst of the Jubilee of Years. So during the Passover of the 33-34 CE Jewish year, we would have expected all the apostles and disciples to return to Jerusalem. With this frame of history, Barnabus and Clements return to Jerusalem, but in route to the Holy City, they disembark in the port city of Caesarea. There they meet with Philip and his daughters, Joseph of Arimathea, the Bethany trio, Lazarus, Mary and Martha, Zaccheus, Nicodemus and many other disciples that were living in Caesarea. The reception must have been exciting because here was a convert of Joseph of Arimathea in England who had become a disciple of Barnabus within four years after the death and resurrection of Jesus. There is no doubt that Joseph and Clements shared a bond of friendship as only two, the Rabbi (teacher) and the student share in a conversion experience. Yet the person Clements was most excited to meet was the Apostle Peter. His joy is portrayed in the passages of the text as he met this charismatic fisherman who became the Nazarene’s most famous orator and public speaker. The skills of preaching were natural to Simon Peter and as such he was ‘’admired” by many new converts to the faith of Yahshua in the Nazarene Ecclesia. Consider the fact that in this residence were some of the most powerful and rich families in all Judea. They were all in exile as the political climate in Judea was very tense. Not only was this a seven year high point in Jewish life, the Sabbatical Year with the Sabbatical Passover, it also was a fourteen year moment to dread because the third Roman census was due the following year in 34-35 CE. The Zealots and the radical fringe of Jewish society were crossing the land urging revolt against the oppressive Roman rule. The Sadducees, seeing the tremendous growth of the Nazarene Party and their effect on urging spiritual reformation in Judea and in the sacrificial services of the temple services, were putting political pressure to exile and excommunicate their former members of the Sanhedrin, Joseph of Arimathea and Nicodemus. As such, Joseph along with the Bethany family and many others sought shelter under the protection of the Roman ruler whom Joseph still had considerable clout and Cornelius the centurion of the Italian regiment of 100 Roman soldiers, who was also called a ‘God-fearer’. So in 34 CE, a British convert of Joseph of Arimathea from the Ynis-wytren on the Isle of Avalon and now a disciple of the Apostle Barnabus from the city of Rome, was meeting with Joseph of Arimathea in Caesarea. What a wonderful testimony that the ‘rays of light’ truly did get to the outer reaches of the British isles and reached it early right after the death of Jesus. The persecution by Shaul (Saul) raged throughout all Jerusalem and with the exception of the apostles living in the city, the rest of the Nazarenes had to flee. Word reached the ecclesia in Caesarea that James the Just was thrown down the temple stairs, and many rumors were coming that he had been killed. Then they found that James the Just with 5000 Nazarenes had fled towards Jericho in the cities of refuge by the Essenes. Many refugees continued on to Perea east of Damascus, the isolated areas of refuge by the earlier Essenes one and one-half centuries prior. The House of Annas was intent with their new “firebrand”, the Pharisee Shaul, to exterminate and imprison everyone who followed ‘The Way”. The most prominent and the most powerful follower of Jesus was Joseph of Arimathea. To Shaul, it did not matter whether they were Roman, British, Greek or Jews. During this time Joseph of Arimathea was a fearless protector of his friends and followers that followed the message and teachings of Yahshua, the son of his niece. He had fiercely defended Yahshua in the council of the Sanhedrin and now he remained as the protector of the flock. All Nazarenes were attacked and thousands were fleeing from the land. No doubt many were fleeing by boats that were owned or leased by Joseph in maritime business of metal shipping. James the Just was gone. Stephen had been stoned to death and now the long arm of the vicious attacks by the House of Annas reached Joseph of Arimathea in Caesarea. They had to reach to the upper echelons of the protective shield of the Nazarenes. 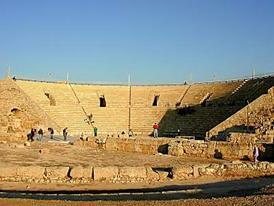 There in Caesarea was Lazarus that they had plotted to kill months before the crucifixion of Jesus in 30 CE. There in Caesarea was Nicodemus, a wealthy “Elder of Israel” who also had been disbarred from the courts of the Sanhedrin. How did it happen? No one really knows. Within all this chaos in Judea, the upper levels of Roman government were becoming concerned. The relationship between Pontius Pilate and Caiaphas had become too cozy. The Sadducees had virtual autonomy in the land of Judea for Pilate had become a virtual pawn at the house of Annas. They threatened to blackmail him during the arrest and trial of Jesus for his insurrection activities trying to assassinate Tiberius Caesar in Rome. This dirty little secret would continue to haunt him. He had shown himself weak and without moral character and the power of greed and control of this mighty family of Jewish politics had taken control of the Roman governance of the land. Since 6 CE when Ananus the son of Seth became High Priest the family of the House of Ananus controlled the economic, political and religious power of Judea for twenty-eight of the prior thirty years between 6 – 36 CE. Tiberius Caesar was in his seventies and his moods were being more dark and erratic. 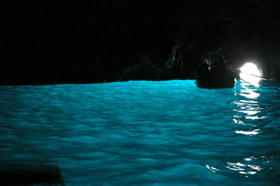 For several years Tiberius lived in isolation on the beautiful Isle of Capri, sending instruction concerning the governance of the empire, yet avoiding all the intrigue of the imperial city. There were no aggressive nor expensive campaigns to conduct nor lands to conquer. The Roman legions remained loyal to him. Yet the new incoming Syrian Legate Vitellius was very concerned. He had three missions to accomplish. The armed forces of Herod Antipas were routed in 35 CE by the Nabathean ruler Arêtes and it was his responsibility on behalf of the emperor to take his legions to the land of Petra and settle the score with the enemy of one of Rome’s faithful client kings. Caiaphas also was stirring up trouble with the Procurator Pontus Pilate when a messianic upstart in Samaria, Simon Magmus, was leading a group of Samaritans to the sacred mount of Mount Gerizim to unearth artifacts of the Lawgiver Moses that were suppose to be buried there. Pilate as usual overreacted and a massacre of Samaritans was stirring the Zealots in the land. Even more so, there was a growing foment of internal unrest with the ‘Jews’ in Jerusalem as the House of Ananus was trying to suppress a new party within Judaism that were following ‘Crestus’, the messianic rabbi in Galilee that the Sadducee leaders railroaded the Procurator into executing him due treason and sedition against Rome. One of Barnabus’ most prominent disciples actually was a British, a known associate of Joseph, called Clements. British Culdic history states that Clements was a Britain and a convert of Joseph of Arimathea. Clementus Romanus became prominent in the Roman church as he became the second Bishop of Rome, nominated by Peter just before his death in Rome in 67 CE. His appointment followed the bishopric of Linus, the royal prince, who was appointed by Paul in 58 AD to be the First Bishop of Rome. Isn’t it interesting that the real history of the beginning of the Roman Christian Church was by two British converts to Christianity, Linus, the first bishop was converted and appointed bishop by the Apostle Paul and the second bishop; Clements was a convert of Joseph of Arimathea and appointed by the Apostle Peter to be bishop of Rome. We also find Cornelius, the centurion of the Italian band of soldiers living in Caesarea in the months after the stoning of Stephen. At this time we find the Apostle Peter staying at the two story villa of Simon the tanner with a balcony overlooking the Mediterranean Ocean. It was there that Peter received a strange vision about a sheet coming down from heaven with a host of unclean animals and the Lord of hosts said to him, “Arise and eat.” Here Peter, that orthodox halachah observing Jew was being asked by the Lord to eat the unclean and invited at the same time to be hosted as a guest in the home of the Roman centurion, Cornelius, who would later be transferred to Caesarea and become the Roman protector of the guest living in the home of the Apostle Philip and his two daughters. When did this happen? Up until now, we have been locked in a model of history that stated that three and a half years after the 33 CE death and resurrection of Jesus, the stoning of Stephen occurred. This historical dating was first proposed by the Roman monks who were dating the death of Jesus according to Jewish prophecies of Daniel but fitting it into a Roman calendar rather than the Jewish calendar of the Seder Olam. The facts in history depict that the stoning of Stephen occurred after Pontius Pilate and Caiaphas had both been deposed by Vitellius in 36 CE. This is a historical fact. With the son of Annas, Jonathan, now the new high priest and the Roman legate busy making was against Arêtes for the Caesar, the evil hand of the House of Annas and the Sadducees arose to create the first martyr and the first persecution for the followers of Yahshua.